Cooking with a wok is a great way to produce quick, healthy meals in the time it takes to boil rice or noodles. Quality China woks are available in stove top or free-standing electric style, so you can easily find the perfect wok for your space. 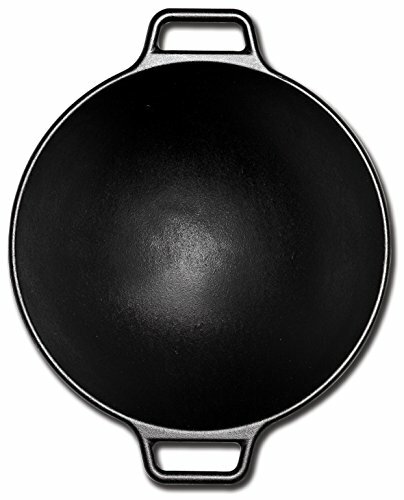 The Lodge P14W3 is an American-made cast iron wok. It's capable of cooking big dishes on high heat on all types of ranges. While cast iron cookware can take a bit of care to use and clean, it'll deliver amazing results if you take the time to do things right. This wok features a flattened exterior to help it balance on the stove, but the cooking surface is curved all the way down. Seasoning your cast iron cookware is a bit of a headache, so it's nice that this 14" wok comes with a basic coat right out of the box. It's not going to compete with your nonstick cookware, but with a bit of use, you'll be able to cook all sorts of foods with a minimum of mess. Be sure to be mindful of your temperatures and be careful when you clean your pan. If you expose the seasoned cooking surface to most household cleaning solutions you'll ruin the coating and you'll have to re-season it before you cook again. Lodge's wok is fairly heavy, so it's not something you want to move around a lot. It also takes a while for heat to penetrate the thick metal. You'll want to wait until the cooking surface is fully preheated to keep food from sticking. On the flip side, the Lodge wok does an incredible job of retaining heat once it's warmed up. Even after you've turned the heat off, your wok will stay hot for a fairly long time. Cast iron is perfect for use with higher temperatures and is often slightly easier to clean than stainless steel due to the layer of seasoning your pan will develop with repeated use. If you don't want to fiddle with keeping your pan seasoned or want something that doesn't take as long to heat up, check out the Cooks Standard and Joyce Chen options below. The Breville BEW600XL is a 14" steel wok with a modern non-stick interior coat. It comes attached to a 1500 watt heating element. Interior temperatures can hit 425F on higher settings, and Breville has thoughtfully included a temperature probe to help you double check how done your meats are. Woks tend to be pretty big, and this Hot Wok is no exception. Traditionally, woks are used over massive gas burners with flames coming well up the sides. It's often awkward to use these curved bottom behemoths on a home range. The inclusion of a built-in heating element solves this issue completely. You get high, even temperatures without needing to fiddle with a burner or wait for your wok to preheat. If you're worried about counter space, you can simply rest this unit on an (inactive) burner while it's in use. The Quantanium non-stick surface is incredibly effective. You'll be able to clean this out after each use with a damp cloth and very little effort, although it's nominally dishwasher safe. You'll want to avoid using any metal utensils, but that's a small price to pay for how easily food slides around without any fat whatsoever. Because of the heating element, storing this wok is a minor pain. You'll need to either allocate some serious cupboard space to this beast or leave it out on the counter. You're also paying for an additional way to heat up a pan. You probably already have a range of some sort. This wok heats up more precisely and evenly than one you'd use on your range, but that might not be worth a whole lot to you financially. Cast iron woks take a while to preheat, while stainless and aluminum woks require you to move them around to distribute heat evenly on a home range. The Cooks Standard 13" stainless wok features generous curved sides that gently feed into a flattened bottom. It's all metal, meaning you're safe to throw it in the oven or use it for long periods of time on high heat. A core of aluminum helps keep temperatures throughout the wok fairly even. This is not a true round bottom wok. The flat disk at the bottom is about 7.5" in diameter and makes up a good portion of the surface you'll actually cook on. The flat area heats up very quickly and evenly on both gas and electric ranges, meaning you won't have to worry about moving your wok while you cook. We thought it was a nice compromise between a traditional round bottom and a flat skillet. That said, if you're after a traditional wok, check out the Lodge or Breville we recommend. You won't have to worry about scratching a non-stick coating or maintaining the seasoned surface of your wok. Instead, you'll have to manage your heat levels carefully and use some fat to keep food from sticking to your 18/10 cooking surface. The Joyce Chen 14" wok is made from carbon steel with a modern non-stick coat. 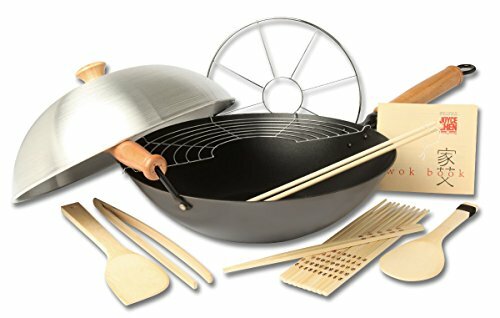 It has a flat bottom and comes with a variety of cooking accessories including wooden paddles, a wok ring, a steamer rack, a tempura rack, and a lid. Unlike other non-stick coatings, the interior of this wok is covered by a 25-year warranty and advertised as being metal utensil safe. We think it's probably best to stick to metal, plastic, and silicone utensils still, but it's nice to know you won't void the warranty if you slip up and use metal once or twice by accident. We're not sure whether or not Excalibur is oven safe. The manufacturer recommends that you cook on low and medium heat, but we can't find an exact temperature at which the coating starts to break down. Competing non-stick surfaces tend to start being unstable at around 400 degrees. You probably should choose the Cooks Standard or Lodge if you want to stick your wok in the broiler or cook with high heat on a regular basis. While the flat bottom of this wok keeps it solid on your stove, it's not quite a traditional cooking experience. That said, it's easy to clean and we love the super long warranty on the non-stick coat. The Presto 5900 is a stainless steel 17" wok with an attached heating element. The product is advertised as being 17", but it's listed as being 17" by 14" by 10". This means that the 17" includes the handles. The wok itself is dishwasher safe, although it's easy enough to wipe out by hand if you keep an eye on your cooking temperatures. It doesn't heat as powerfully or evenly as the Breville above, but it's an option to consider if you want an electric wok without the hassle of a non-stick coating. The flat bottom of this wok is the only part in direct contact with the heating element. There's a layer of aluminum sandwiched in between layers of steel to help distribute heat throughout the entire bowl, but you'll have to let the wok sit for a little bit after dialing in a temperature to get the sides hot. This only adds a minute or two to each cooking operation, but it's not something you have to worry about with the Breville. The lack of a nonstick coating works out to be a minor plus, in our opinion. Not only can you be fairly careless with utensils and cleaning tools, you can also eschew the use of soap to build up a layer of baked-in oil similar to a cast iron pan. Once this wok is seasoned, it'll have some fairly impressive non-stick properties that you won't need to worry about scraping food. 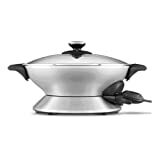 Like other electric woks, this unit is more difficult to store than its range-reliant counterparts. You'll need to allot some serious counter top real estate or clean out a big chunk of a cupboard. While it's not the most powerful electric wok on the market and it heats up a bit unevenly, the Presto electric wok is still an excellent budget option for most households. A wok is a cooking pan commonly used in Asian cooking. It's a wide, flared pan with a small flat area in the center. Woks are highly versatile in the kitchen; you can use them for traditional stir-frying with just a bit of oil in the bottom, or you can add more oil and deep fry. Finally, because the food in the bottom gets more heat than the food pushed up the sides of the pan, woks make it easy to prepare quick one dish meals. Woks are available in a wide variety of metals. If you prefer to use a stove top wok, there are several options available. A carbon steel wok has lighter material than cast iron and easier to season or make non-stick than stainless steel. To work properly, your carbon steel wok should have a flat five inch circle across the bottom with a twelve inch span of metal up the sides. 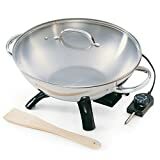 If possible purchase a spun wok instead of a stamped wok. Stamped woks are smooth and make it hard to move food away from the heat at the bottom of the pan. Spun woks feature concentric rings up the side which produce a bit of grab. Proper wok cooking requires high heat, so a long handle will better protect you from burns. Northern style woks have a long handle on one side and a small handle opposite for easy lifting and transporting. Cantonese-style woks offer two small handles. A long handle helps to keep your hands away for safety. Electric woks are a quick and portable way to make a meal. While previous generations of electric woks seldom offered the heat necessary to properly sear meat and proteins, newer generations are much improved. Depending on your material preference and size-needs, you can invest in a non-stick or a stainless steel electric wok. Once you put the lid on your walk, you're steaming instead of frying. While all electric woks are sold with lids, it's important to note that most wok cooking should be done in the open air. Traditional Chinese wok cooking requires the vegetables and meats be seared to bring out the crunchy flavor of these foods. While your wok is new, avoid steaming or any form of water based cooking. Your new wok needs fat to produce a good non-stick seal. Per Emma Christensen the first step is to wash your wok to remove any rust-inhibiting coating. Dry it over low heat to remove all moisture. Once all your windows are opened and the exhaust fan is on, set a stove burner to high heat and set your wok on the burner. Heat the wok until drops of water evaporate in two seconds or less when flicked at the surface. REMOVE THE WOK FROM THE BURNER. Add two tablespoons of peanut oil to the wok and swirl it around the pan to coat the bottom and sides. Place the wok back on the burner, reduce the heat and cook up a batch of chopped onions with ginger or pepper; anything aromatic will work. As you cook, you'll notice the wok darkening. The trick to stir frying is to cut all the vegetables and meats to similar sizes. Cook in small batches to allow everything in the pan to sear, and use the outer edges of your wok to move things away from the heat. Start with any meat you're preparing, then move it up once it's cooked. Avoid soap! This will break down the patina you've worked so hard to build. If you're just building a collection of kitchen tools, you may find that a wok can serve for several cooking pots. Nearly any oil-based cooking style can easily be done in a wok and is actually good for them! We really like the Joyce Chen Wok Set​ because it includes most things you will need to start stir-frying immediately. Whether you decide on a stove top or an electric, build a habit of cooking with the lid off to sear in the delicious fresh flavor of crisp vegetables and fresh meats. Clean your wok simply to protect the patina and you can enjoy this versatile tool for years. Did you enjoy this guide? Let us know in the comments with your favorite type of wok and wok cooking experiences. Gotham Steel vs Copper Chef Cookware – Which Is Best?